The Magazine has part 2 of the Sonic X comic, Posters of Aliens in the Attic and Power Rangers RPM. There's a Pokemon Battle Dimension quiz, Harry Potter and the half-blood Prince facts and info on the characters from Aliens in the Attic. There's also a review of the G.I.Joe: the Rise of Cobra videogame and a Duplicator featuring Monferno from Pokemon Battle Dimension. Free Gifts: Jimmy Two-Shoes mini skateboard, sticker sheet featuring the Ninja Turtles, Transformers and Ice Age 3 videogames plus the new Nitro! logo, Dinosaur King pocket-mag, Nintendo DS magic wand stylus and a Wizard's spell book. 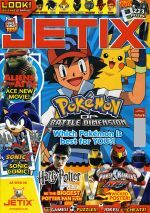 This is the last issue of Jetix Magazine as next month it will be renamed to Nitro!. It looks like it will be a bit different as it's to feature other tv shows, lets hope they keep power rangers in it. The price of this issue was again up to £3.99.